Availability: Second hand, or ported to consoles and bundled with the 2011 sequel. Being a godless, uncouth Yank, I have never read Carroll/Dobson’s Alice’s Adventures in Wonderland. My own childhood was mostly Winnie the Pooh, some Disney movies, and then right into the Ninja Turtles phase. American McGee and the team at Rogue, however, have indeed read the story. Their sinister take on the illogical whimsy of Alice’s adventures provides the content for this game – a third-person platformer starring a troubled girl fighting her personal demons made manifest. Shrunk to insect size, we ride a leaf while fending off attacking bugs. Even without catching every (or most) references to the original story, the way the game handles this dark remake is pretty intriguing. A sharp CG intro sets the scene: Alice (the player character) is a young girl enraptured with the adventures of Alice (from the book). As she falls asleep from another late night spent reading of Wonderland, the lamp she left on breaks and starts a fire that destroys her home and kills her parents while she watches helplessly. Now living in a catatonic state within an asylum, her consciousness dwells a twisted version of her favorite tale. The story of Wonderland is somewhat retold in this manner. You’ll chase the White Rabbit, you’ll fight the Red Queen’s minions, you’ll attend the Mad Hatter’s party, and you’ll seek out Caterpillar for advice. The difference is that Alice and the characters around her are very self-aware. She relives the story while being familiar with it. She knows the surroundings and is upset with the macabre shift they’ve taken, and characters likewise know Alice and look to her as a savior. It’s not quite a sequel, it’s more aware than a retelling, and it overall fits the theme perfectly. Meanwhile, blunt allegories to her guilt and loneliness are sprinkled through – from the Pool of Tears being fed by a weeping Alice statue, to the Jabberwock directly taunting Alice while fighting inside a burning rendition of her home. The Quake III engine runs the show, and does a 3rd person shooter admirably – but not flawlessly. The environments and lighting look great, and the engine is able to twist the world in splendid ways. You’ll traverse rooms turned upside down, shrink down to ant size and ride boats made of leaves, hop across floating platforms while a tempest of clocks twirl around you, navigate a maze of mirrors, and balance tricky jumps on seesaw-pivoting ledges. 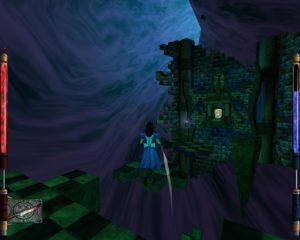 Alice can grab nearly every straight edge and climb up, which is central to many of the required platform jumps. She can also use her dress to float on drafts and rise vertically up some levels. In general, the engine renders many impressive sights and appropriate platforming challenges. 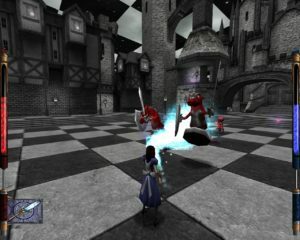 Some of the Queen’s levels have an interesting black and white effect. Stiff animation and some awkward jumps most betray that this is running on an engine not expressly designed for this kind of game. 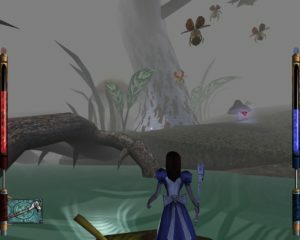 Alice runs forward at an appropriately dainty toddle, but twists unnaturally at any kind of side or circle-strafe movement. Her jumps are incredibly floaty, and while you can steer yourself in midair, it’s just as easy to overshoot a platform entirely. There are enough precision jumps onto moving or timed platforms to make this an issue. Likewise, there were more than a few times when a jagged ledge caught Alice’s feet mid-jump and sent her sliding down to her doom. There’s supposed to be a helpful icon indicating when you can safely jump (or, more precisely where your jump is altered or shortened to land safely), but this usually doesn’t appear. It’s helpful when it does, but more often then not you’ll lack the precision needed to nail some of the trickier hops on the first try. There’s also no feedback with melee combat, which you’ll be doing plenty of. 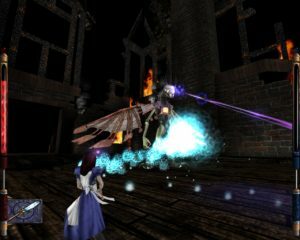 Alice’s animations don’t react to hitting anything, so she’ll swing right through her enemy with only a spot of blood and a sound effect to signify a successful hit. This extends to bosses as well, who often show no signs of taking damage at all. I quit the final boss a few times, utterly convinced I wasn’t doing it right, when I was actually just a few more hits from victory. 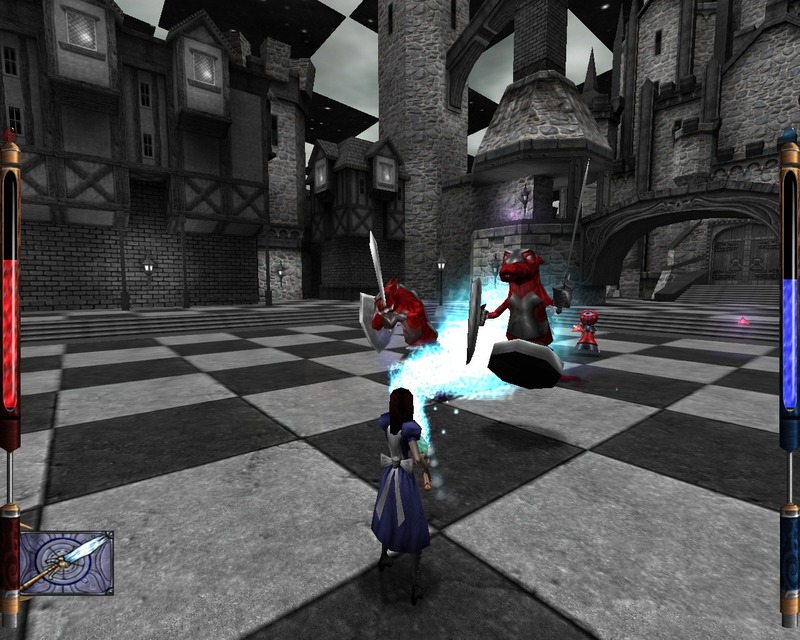 Alice also has a noticeably first-person-shooter take on combat. The focus here isn’t on avoiding damage – a lack of rolls, dodges, or general room to maneuver means taking hits seems inevitable. Instead, you’re expected to dispatch enemies quickly and collect the generous life crystals they drop. These lose efficacy over the time they remain uncollected, but even the weakest one can zap your health and magic bars up by about 1/4th. “Tougher” enemies also drop larger health crystals, but many of these guys can be defeated very easily once you gain the right weapon, while still dropping the large health boost. This makes Alice pretty easy on the combat side, but I actually didn’t find it unwelcome. The focus here is definitely on the environments and insane sights, not the monsters standing in your way. The Jabberwock is a good, old-fashioned boss fight. The final connection to its Quake roots is in the violence. Card guards can be sliced bloodily in half. Soldier ants can be decapitated. Hitting a weakened enemy with a strong attack sprays them apart in classic bouncing Quake gibs, and even regular attacks leave blood spatters on the ground. It’s as absurd as it was in Quake III, but also not out of place with the horror elements of the plot. Alice’s new Wonderland is supposed to be a darkly violent place. Regular minions have no qualms about skewering her or attacking with razor appendages, but the newfound hostility is never more apparent than in bosses’ willingness to roast you alive, or with Alice’s responses in kind. In short, people will die badly. For instance, the grotesque Dutchess chases you with a pepper grinder. If you win the battle, the grinder malfunctions and causes the Dutchess to sneeze so hard she blows half her skull off. It’s goofy 1990’s computer game violence, but it certainly fits. While combat may not be that complicated, the tools of your violent trade are brilliant. Most of Alice’s weapons are based around children’s toys, and every weapon has a secondary fire mode to increase its effectiveness. A jack in the box can be thrown out like a grenade, or triggered as a flamethrower turret. The ice staff can shoot a stream of energy (much like an ice flamethrower), or build a temporary barrier to hide behind. Some weapons also directly reference Alice and Carroll’s work, like the flamingo-shaped croquet mallet, or the Vorpal blade as your default attack. They’re all useful and scale magnificently, so each weapon has clear benefits over the last. However, they’re also less situational than you might expect, which means you’ll fall in love with a weapon for a few levels before it is supplanted by the next. I thought the croquet mallet was going to be my go-to until I found the ice staff. I thought nothing could top that until I found the homing jacks. I thought I’d use the jacks for the rest of the game until I completed the Jabberwock staff. It does at least keep you entertained as you play, and looking forward to the next overpowered implement of destruction, but again, don’t expect much in the way of complicated or strategic combat. Plenty of platform jumps await. Sound effects are fine and fitting, but for once, I have more to say about the music. It’s twisted and dreamlike without being obnoxious. Many tracks used distorted versions of children’s songs or music boxes as their base, and while this sounds cliche, it’s executed fairly well. The most direct similarity I can think of is Danny Elfman’s score for Batman Returns – use of chimes, carolers, and tones are all quite alike. I enjoyed the style here and thought it matched the setting perfectly. The only downside is that many of the tracks are very short bits (seemingly no more than a minute or two) that loop throughout the level. Some praise should also go to the voice actors. Susie Brann as Alice delivers lines in just the right amount of light whimsy. Alice may be out of her mind, but she’s quite level-headed within her dream, which allows for appropriately Carroll-esque back and forth dialogue and plays on words. She does have moments where the weight of reality pierces the dream, and Brann’s readings hits the character’s confusion and despair. The only disappointment is that the nature of the game engine often slaughters the delivery here, with more stiff “grief” animation and some cheesy “boo-hoo-hoo” crying loops. Roger Jackson as the Cheshire Cat is also a delight, and I love the tweak to take the character into much more sinister directions. Jackson delivers his cryptic advice with sly glee, and a pitch not too far off from a growl. You never quite know if you can trust the Cat, but either way, you definitely sense his own motives at work. You can argue that taking Alice out of playful nonsense and into nightmare horror is unimaginative and obvious, but it undeniably works here. Many of the sights and scenes still hold up today (though admittedly, seeing many before elsewhere, such as Clive Barker’s Undying, lessened the impact). This is not a game designed or meant to offer a serious gaming challenge, and some engine issues keep it from being a spot-on example of good platforming, but this Wonderland has plenty to show you if you’re willing to go along for the ride. Smart take on Alice, and well-executed to boot. Doesn’t drag on. Lots of warped sights to see. Fantastic weapons, but simplistic combat. Some troubles with trying to do a platformer on this engine. as it contains so much fascinating information about the references, jokes, double meanings, and hidden meanings of things in the two stories. The two stories are classics of children’s literature, have stood the test of time, and I really doubt that there’s a better way to read them than via this book.